Dean Kamen is a leading American scientist and inventor whose products include the Segway human transporter (HT) and the iBOT battery-powered wheelchair. His numerous inventions include medical devices and futuristic gizmos that Kamen hopes will revolutionize the way we live and travel. Whenever Kamen introduces a new product, people take notice, and they eagerly anticipate the next one. His newest creation? A nonpolluting, low-power water-purifying system designed for use in underdeveloped countries. Time magazine called it one of the "coolest inventions of 2003." 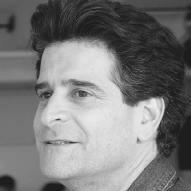 Dean Kamen was born in 1951, in Rockville Center, Long Island, New York. His father, Jack, was an illustrator for Weird Science and Mad comic books; his mother, Evelyn, was a teacher. Kamen began tinkering with gadgets when he was fairly young. He claims that when he was five years old he invented a way to make his bed without running from one side to the other. However, despite the fact that he was obviously bright and very curious, Kamen did not do well in school. His grades in junior high and high school were only average, and Kamen often found himself at odds with his teachers. This is an experience that many creative people seem to go through. For example, Thomas Edison (1847–1931), who developed the electric light bulb and the phonograph, attended school for a grand total of three months. His teachers considered him to be a slow learner. Instead Edison was taught by his mother at home, where he thrived, reading every book he could get his hands on. Like Edison, Kamen was (and still is) an avid reader of science texts. By the time he was a teenager, Kamen was being paid for his inventions, most of which he built in his parents' basement. He was hired by local rock bands and museums to design and install light and sound systems. He was even asked to work on automating the giant ball that is lowered in Times Square each year on New Year's Eve. Before he graduated from high school, Kamen was earning about $60,000 a year, which was more than the salaries of both his parents combined. "If you start to do things you've never done before, you're probably going to fail at least some of the time. And I say that's OK."
After high school Kamen attended Worcester Polytechnic Institute (WPI) in Massachusetts, but again he was more interested in inventing than attending classes. It was during his early years at WPI that Kamen developed the first of his many medical breakthroughs. His older brother, Barton, who was in medical school, commented to him that patients who needed round-the-clock medication were forced to come into the hospital for treatment. Kamen decided to fix the problem. He came up with the AutoSyringe, a portable device that could be worn by patients and that administered doses of medication. As a result, patients were able to enjoy some freedom. In 1976 Kamen left Worcester Polytechnic (without graduating) and founded his own company, called AutoSyringe, to sell his medication device. The medical community embraced the AutoSyringe, and among scientists Kamen soon gained a reputation as a maverick inventor. In 1982 Kamen sold AutoSyringe to Baxter International, an international health-care company. The sale made him a multimillionaire. Dean Kamen established FIRST (For Inspiration and Recognition of Science and Technology) in 1989 because he wanted kids to get excited about science. A science competition seemed like a good idea, but he did not have a run-of-the-mill science fair in mind. Instead, Kamen developed a robotics competition. The first robotics competition took place in a small New Hampshire high school gym and involved only twenty-eight teams. In 2004 there were more than eight hundred teams in the United States and around the world, competing in twenty-three regional events and a championship event held in Atlanta, Georgia. But, what is a robotics competition all about? It is a lot like a high school athletic event where teams compete in games of skill, except in robotics, the game changes every year. In early January, FIRST releases the rules of the game, which include how the playing field will be set up and what tasks a robot will be expected to perform to win the most points. For example, in 2004 a robot had to collect balls and deliver them to a human player who shot the balls into a goal. Teams are then given six weeks to design, build, and test their robots. Companies sponsor local high school teams, providing money to help with costs and technical support to help build the actual robot. The company engineers also serve as mentors to the students throughout the experience. At regional competitions the atmosphere is charged. Teams wear colorful T-shirts and uniforms that they design with their logo; they also cheer and root for their favorite players. Music is played over loudspeakers, and announcers and referees broadcast during the matches. Teamwork is encouraged. As part of the game, teams are paired together during each match. In match thirteen, Team 182 may be partnered with Team 115; in Team 182's next match they be competing against Team 115. Winners at the regional level move on to the national competition in Atlanta, where ultimately one winning alliance (composed of three teams) takes the title. On the FIRST Web site, however, Kamen explains that winning is not what matters: "Here, whether your robot wins or not, you come away ... with an understanding of what is possible in the world. After selling AutoSyringe, Kamen moved to Manchester, New Hampshire, where he launched his new company, DEKA Research & Development. DEKA is a combination of the first two letters of Kamen's first and last names: DEan KAmen. The DEKA research facility is a vast network of nineteenth-century brick buildings that sprawl along the banks of the Merrimack River. Over two hundred researchers, engineers, and machinists work there and focus both on developing products for other companies and advancing Kamen's own projects. For example, in 1993 Kamen and company invented a portable kidney dialysis machine called HomeChoice. A kidney dialysis machine is used to purify the blood of someone whose kidneys do not function properly. Usually a patient must go to the hospital on a regular basis to be treated. Kamen went on to impress the medical world by developing hundreds of inventions. In 1999, however, he wowed the rest of the world when he unveiled the Independence iBOT 3000 Mobility System, a stair-climbing wheelchair. "I just thought the existing wheelchair was a pretty inadequate solution," Kamen explained to Max Alexander in a Smithsonian interview. The iBOT is a motorized wheelchair that can take on almost any terrain, for example sand, gravel, or grass. It can also climb stairs and curbs, and it raises itself up, balancing on two wheels, so that a user can be level with a standing person. According to Kamen, the stair-climbing capability was great, but for years wheelchair-users had told him they longed to be able to carry on a conversation eye-to-eye. In 2003 the iBOT was finally approved for sale by the U.S. Food and Drug Administration (FDA). The FDA is a government agency that researches products to make sure they are safe for people to use. The iBOT went into production in late 2003 and was available at a cost of $29,000. People who bought an iBOT were required to go through special training on how to use the system. 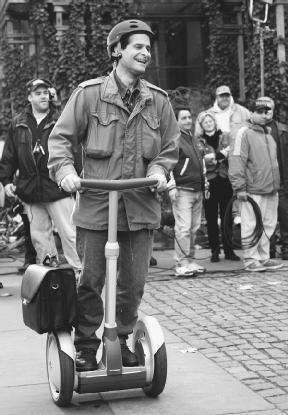 Dean Kamen rides his invention, the Segway Human Transporter. Heilemann, however, Kamen claimed that the Segway would "be to the car what the car was to the horse and buggy." The Segway has no brakes, no engine (it is battery-powered, so it needs to be charged), and no steering wheel. It can carry a rider who weighs up to 250 pounds, and cargo up to 75 pounds. And it can travel at speeds up to 17 miles an hour. The amazing thing about the machine is that, like the iBOT, it is totally self-balancing, which means it cannot tip over when a person is riding it. Both inventions rely on a system of gyroscopes, computer chips, and electronic sensors that together pick up tiny shifts in the rider's movements. Basically, the Segway does what you want it to do. For example, if you step off, the Segway comes to a stop. Kamen had high hopes for the Segway. He did not see the Segway as a toy scooter; he believed that it could help solve the problem of overpopulated cities. "Cities need cars like fish need bicycles," Kamen told Heilemann. The inventor envisioned people in cramped urban areas, like San Francisco, California, or Shanghai, China, scooting around on their Segways. As a result, pollution and congested city traffic would be eliminated. Kamen also predicted that the Segway would be used by postal workers, police officers, factory workers, and even soldiers on battlefields. By 2004 the Segway was not quite as successful as Kamen predicted: only six thousand machines had been sold. Buyers were curious, but not curious enough to pay $4,950 to own one, and problems were cropping up everywhere. The company had to recall, or take back, models because riders were falling off their Segways when the machines' batteries went low. In addition, laws in several cities, including San Francisco, prevented people from riding Segways on city sidewalks. A major blow came in February of 2004 when Segways were banned from Disney-owned theme parks. It seemed that people were not quite ready for the ride of the future. In 2003 Kamen was ready to tackle another serious problem: contaminated water. During the 1990s he had experimented with a way to power the iBOT and the Segway. He focused on the Stirling engine, which was developed in 1816 by Scottish inventor Robert Stirling (1790–1878), because it produced efficient power that was clean and quiet. It was also complicated and expensive to build. The Stirling engine was not right for his transportation machines, but Kamen believed he could use it to help make clean water. According to the United Nations, an organization of countries working together to keep peace and solve problems, approximately six thousand people die every day from drinking water that is not clean or safe. After the media hype that surrounded the Segway, Kamen was cautious about predicting the success of his water purifier, nicknamed the Slingshot. It was still costly to produce, but it was small, weighing about one hundred pounds, and it could run on almost any fuel, including wood, grass, or cow dung. Plus, the purifier required little maintenance and would make ten gallons of drinking water an hour. In November of 2003, Kamen told Lev Grossman of Time magazine that he was not sure how to market the Slingshot or how to get it to the people of the world who needed it; what he did know was that it works. In 2004 a determined Kamen visited the African countries of Rwanda and Bangladesh to demonstrate his system. He planned to visit India and Pakistan later in the year. Throughout his career Dean Kamen has received an amazing number of awards, including the Heinz Award (1998), "for a set of inventions that have advanced medical care worldwide," and the National Medal of Technology (2000). Kamen's National Medal acknowledges his inventions, but it also applauds him for "innovative and imaginative leadership in awakening America to the excitement of science and technology." Kamen's passion for science has created a need in him to ignite that spark in others, especially young people. According to Max Alexander, he is a "one-man band banging the cymbals of scientific innovation." In 1989 he founded FIRST (For Inspiration and Recognition of Science and Technology). The focus of FIRST is an annual competition where high school teams, with the help of corporate sponsors, build robots and face off in regional and national games. The goal of FIRST is to get young people excited about technology. As a result, they might even consider a career in math, science, or engineering to be an appealing option in a society that idolizes actors, rock bands, and sports stars. Kamen told Forbes's Glenn Rifkin, "We'll be successful when you can walk up to the average kid on the street and he'll be able to name a few heroes who ... don't dribble a basketball." One of those heroes just might be Kamen. Since he unveiled the Segway on national television, Kamen has become something of a celebrity. He is an easily recognizable figure, with his shock of dark hair and his trademark uniform of jeans, denim shirt, and work boots. Kamen is also a savvy salesman who tirelessly crows about his inventions. Such salesmanship has made Kamen a very rich man. He lives in an enormous house in Manchester, Connecticut, that is powered by a giant wind turbine and has a fully equipped machine shop in the basement. Out back there is a lighted baseball diamond and a landing pad for his two helicopters, which Kamen helped design. He also owns an island off the coast of Connecticut. And there is no sign that Kamen is slowing down. Unmarried and with no children, his work seems to be his life, but, as he comments on the Segway Web site, "You know, it's only work if you'd rather be doing something else." Alexander, Max. "'Wow, Isn't That Cool!'" Smithsonian (September 2003): p. 95. Grossman, Lev. "Water Purifier: Thousands Die Every Day for Lack of Clean Water. Can the Man Who Invented the Segway Save Them?" Time (November 17, 2003): p. 72. Heilemann, John. "Reinventing the Wheel: Here 'It' Is.' Time (December 10, 2001): pp. 70–76. Levy, Steven. "Great Minds, Great Ideas." Newsweek (May 27, 2002): p. 56. Rifkin, Glenn. "Geek Chic: Dean Kamen Hopes to Encourage Students to Study Sciences and Technology." Forbes (February 26, 1996): pp. S40–43. For Inspiration and Recognition of Science and Technology (FIRST) Web site. http://www.usfirst.org (accessed on May 29, 2004). Science Enrichment Encounters (SEE) Science Center Web site. http://www.see-sciencecenter.org (accessed on May 30, 2004). Segway Web site. http://www.segway.com (accessed on May 30, 2004).